English nurse and statistician , known as “The Lady With The Lamp,” who pioneered the improvement of nursing practices following her experience in the Crimean War, and continued to raise respect for nurses as medical professionals. from The Scrap Book (1908). 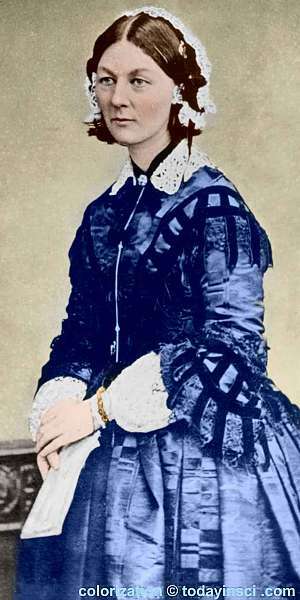 Florence Nightingale, The Famous Nurse Of The Crimean War. King Edward Has Lately Conferred Upon Her The Much-Coveted Order Of Merit. From a photograph by H. Lenthall, Bournemouth. EVERY one was much astonished lately to read in the newspapers a cablegram to the effect that King Edward had conferred the Order of Merit upon Florence Nightingale. The surprise arose from the fact that very few persons were aware that this remarkable woman was still alive. The circumstance is characteristic of her modesty and retiring disposition. In 1854. Miss Nightingale organized a department of nursing at Scutari to care for the sick and wounded of the British army during the Crimean War. She was a woman of wealth, but had devoted her early years to the study of hospital work. During the Crimean campaign, the mismanagement of the British hospital Service was terrible. There was a dearth of doctors, and a vast ignorance of what to do and of how to do it. Moreover, although there were medical supplies and rations in abundance, they were all stored away so that they could not be obtained when needed except after long unwinding of official red tape. Meanwhile, thousands of brave men were dying of fever, of putrescent wounds, and of starvation. Miss Nightingale, who possessed extraordinary administrative abilities, energy, and courage, went to the officer in charge of the storehouses full of needful things. The official stolidly declared that he could not give them up without an order from some remote bureaucrat. Miss Nightingale at once called to her aid a squad of soldiers. This gentle woman seemed transformed into a creature of fire and victorious energy. “Break down those doors!” she commanded the soldiers imperiously. No one dared oppose her; and from that time she became the idol of the army and the heroine of the war. When it was over, she refused all public notice or reward, but returning to England she gave out of her own fortune the sum of fifty thousand pounds to establish a home for the training of efficient nurses. Now, in her eight-seventh year, she has been decorated, and is the first woman to be admitted to the Order of Merit. This order was, instituted by King Edward VII in 1902. No one can enter it save those who have won distinction in science, art, war, or the professions. Very few—only nineteen in all—have so far received this decoration. Among these few are Lord Roberts and Lord Kitchener. representing the army; Lord Rayleigh and the late Lord Kelvin, as leaders in natural science; Lord Lister, because of his contributions to medical knowledge. Science Quotes by Florence Nightingale. 12 May - short biography, births, deaths and events on date of Nightingale's birth. Florence Nightingale - testimony she gave to Parliament on poor clothing, food supplies and the state of the hosital at Scutari (20 Feb 1855). Florence Nightingale: The Making of an Icon, by Mark Bostridge. - book suggestion.